Location: Kiarutara Home,Gatanga, Murang’a County. It is with great humility and acceptance of God’s will that we announce the demise of our beloved Jeremiah Kibe Muriu of Muriu Guest House and Kariara Snack Café, Nakuru, on 2nd May 2018 at Mater Hospital Nairobi. Husband of the late Agnes Gachiku Kibe ,Father of John and Siphirah Muriu (Kiarutara),Patrick and Mary Ruhang’i (Califonia,USA),Eng.David and Veronica Ngungu Kibe (Membly and Manyatta Millers Ltd),Miriam Mugure(Nakuru),Jane Wambui (Kariara Snack café),Daniel and Susan Gikeri (Free Area, Mzee wa Nyama,Nakuru), Peter and Priscilla Kimani (Nakuru), James and Veronica Wang’ang’a (Muriu Guest House),Charles Njagu and Racheal Wairimu (Muriu Guest House). 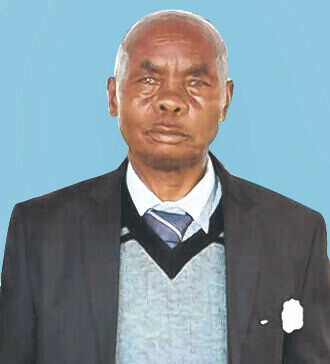 Son of the late Samuel Muriu and Miriam Wambui.Brother of Tabitha Wairimu Muiga (Mwagu), David Ngungu Muriu (Kiarutara), Teresia Wanja Njoroge (Gatakaini), late Lydiah Waithera Ngochi, Hannah Wakonyo Kinya (Gatakaini), Samwel Kimani Muriu aka “Seek Him” (Kiarutara) and Harrison Njagu Muriu (Nakuru). Brother in law of Cecilia Wambui, Njoroge Kiguru, Samwel Ngochi, Zakaria Kinya,Hellen Wagaki, Elizabeth Murugi, Daniel Gikeri, Mary Nyanduru, Isaac Muthunga and others. Cousin of Samwel Kibe, David Kibe, Zachary and Joyce Mwaura, Kenneth and Prof. Zipporah Ng’ang’a, Dr. James Njagu and others. Uncle of Eng. Moses Kinya (Thika Water), Teresia Wathithi (Britain) and others. He was in law of late Kaibere Kagema (Kangema), Mathew Kaminja( Rwegetha) and others. Grandfather and friends to many. Friends and relatives are meeting daily for prayers and funeral arrangements at Muriu Guest House Nakuru, his Kiarutara Home,Thika Coconut Grill Kwanza Hall and residence of David Kibe in Precious court Membly, Ruiru, daily From 6pm. The cortege leaves Kenyatta University mortuary on Friday 11th May 2018 at 8am for a funeral service at 10am at Kiarutara Primary grounds.Thereafter the body will be laid to rest at 2pm at his Kiarutara Home,Gatanga, Murang’a County. Rest In Peace Distinguished Warrior, Businessman And Christian Servant.